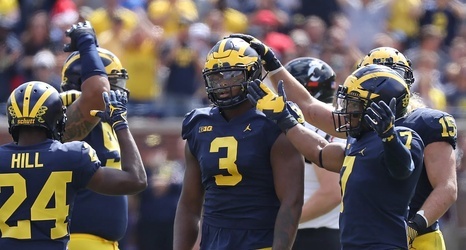 There were many familiar faces in Ann Arbor and at Michigan Stadium this weekend for the Wolverines’ spring game. Signees in the 2019 class showed up, as did recruits in the 2020 and 2021 classes. One of the bigger names that visited was 2021 4-star defensive end Quintin Somerville. The 6-foot-3, 230-pounder from Scottsdale, Arizona could end up being one of the top defensive linemen in his class, and is currently the No. 18 overall player, according to 247Sports. Somerville spoke to Maize n Brew about his first trip to U-M, a trip he called “amazing.